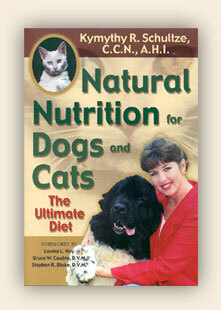 Animals Healing.com -Natural Nutrition for Cats and Dogs by Kymythy R. Schultze, C.C.N., A.H.I. There are an estimated 60 million dogs and 70 million cats living as our beloved companions in this country alone, and feeding them is a multibillion-dollar business. A significant proportion of animal guardians are now turning to holistic health care to prevent disease and enhance their animals' well-being. The foundation of holistic care is optimal nutrition. Our own doctors extol the virtues of eating fewer processed foods and adding more fresh foods to our diet if we wish to enjoy good health. Certainly, our dogs and cats deserve the same consideration! In this reader-friendly book, author Kymythy R. Schultze shows you how a species-appropriate diet of raw, natural foods can lead to an enhanced quality of life for your companion. You'll learn how to easily prepare nutritious homemade meals, which can help your animal develop a shiny coat, healthy skin and digestion, clean teeth, bright eyes - and also reduce flea problems and bad breath. A Holistic Animal Resource Guide is also included, with recommended sources for Associations & Organizations, Books, Periodicals, Practitioners, Products and Videos. Kymythy R. Schultze has been a trailblazer in the field of animal nutrition for over a decade. She is a Certified Clinical Nutritionist (C.C.N.) and Animal Health Instructor (A.H.I.) who lectures on natural nutrition and holistic care for dogs and cats worldwide. This book has a brilliant, simple presentation of information that takes the mystery out of how to feed your dog or cat fresh, healthy, well-balanced meals. So easy to follow and full of great tips and advice!